Illustration 0.1 - The dipole field of the earth The magnetic field of the earth is still shown in the today's media as a field which corresponds to the field of a rod magnet or a current loop. However, this dipole model can be looked only as a first approximation. It is not the final figure of the earth magnetic field as it is presented over and over again. This will be seen in the following. However, according to older information the dipole field includes only about 80% of the intensity of the whole earth field. A newer investigation by Nevanlinna, Pesonen and Blomster which occurred in 1983 came to the conclusion that the dipole character of the earth field amounts to about 90%. Within the geosciences there is since fairly long time the model of the geo-dynamo, and quite experimental arrangements also exist (e.g., in Karlsruhe) in which is tried to generate the magnetic field of the earth. 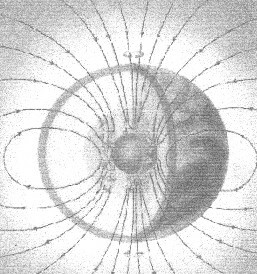 However, these experiments do not concern the external figure of the earth magnetic field, but investigate merely the internal processes which appear with the origin of the dynamo-effect. Particularly also here merely one dipole field is generated and it is, on account of the construction, only a simple rotation-symmetrical field. See in addition the publication "It is possible to simulate the magnetic field in the lab?" from R. Goldfinch and U. Müller which occurred in 1999 in the research centre Karlsruhe. The dipole model, traded as a general consensus, blocks the view of certain structural phenomena of the earth magnetic field. If you look away from the real field-generating elements in the earth inside and concentrates merely upon the magnetic field around the earth, an alternative view, based on oscillations, can be also applied here. Since 1990 the author pursues own researches above the magnetic field and the figure of the earth. Besides, an oscillation model with lattice structure of the earth magnetic field was developed which is based on an Fourier analysis of the total intensity from the complete magnetic earth field and is hence also quantifiable. From the radial structure of the magnetic oscillation system can be derived that a (magnetic) oscillation spectrum forms the basis of the bowl construction of the earth, as well as the stratifications of the atmosphere. Geologic bowls and atmospheric layers are embedded in the magnetic oscillation structure. A consequence of this fact is that atmospheric events, so climate and weather, above the magnetic field are determined by the inside of the earth. This has not been taken into consideration in any climate or weather model up to now !!! The oscillation model of the magnetic earth field likewise delivers the basic frequencies of the earth. The Schumann-frequency is already included in the spectrum of the earth frequencies and also the frequencies of the sferics (weather frequencies) can be quite exactly derived from the model. A functional connection exists between the Schumann frequency and the earth frequency derived in the model. From it there results again a whole spectrum of frequencies which one can call biological frequencies. And with this fact electric smog can be defined new. All life on this planet is adapted to certain frequencies or frequency areas. If these frequency relations are disturbed in a longer term so this leads to biochemical up to physiological changes which are able to discharge also into illness. This publication (or the accompanying book) delivers in addition an overview of the research to the electromagnetic compatibility and to the magnet adoption of the last hundred years with 1530 references and about 1900 names. In the middle of the 70th W.R.Adey and S.M.Bawin made experiments with cerebral tissue. They irradiated the tissue with modulated VHF fields. They found with her investigations a narrow intensity area and frequency area in which the treated cells reacted. Nevertheless, beyond these areas none or only minimum reaction occurred. The experimentally ascertained frequency area is called, in the meantime, Adey window. Also the ascertained frequencies of the Adey window adapts themselves harmoniously in the oscillation model and it can be shown that this frequencies form a Fibonacci sequence. This numerical sequence finds her application in the nature, e.g., with spiral growth of plants or also in the population strength of bees and hares. The Fibonacci sequence appears always where the golden section plays a role. Further still there arise amazing relations, connections and explanations of areas which counted up to now rather than pseudo-scientific or even esoteric like the Hartmann-grid and Curry-grid or also the Benker-cube system. The external earth magnetic field can be shown completely as a sum of so-called global net grids (GNG). It appears that the Hartmann-grid and the Benker-cube system show, so to speak, two sides of the one and same phenomenon. Practically all so-called global net grids (GNG) can be explained about the oscillation structures of the earth magnetic field. Namely as stationary spatial oscillation systems which are connected with certain frequency. About the connection of Hartmann grid and Curry grid even the mathematical source points of the earth magnetic field can be determined. And thereby the whole field of the earth can be explained as a sum of two oscillation systems, what leads to an astonishing consequence concerning the Curry net. A consequence of the model is that grids are measuring-technically detectable if one takes magnetic intensities as a function of frequency into consideration. Caused by the measuring-technical ascertainability, a suitable measuring instrument would make divining rods superfluous, concerning global grids. Another point by physicists often than esoterically dismissed are planetary oscillation systems. Possibly at the end of 19th century the geologists W.L Green and A. de Lapparent compared the figure of the earth with a tetrahedron. A similar comparison did in the sixties of the twentieth century B.L. Litschkow and N.N.Schafranowski with an octahedron. 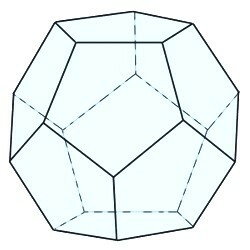 Litschkow published a little later still the model of a dodecahedron and an icosahedron for the earth figure. In 1974 Nikolai F . Gontscharow, Wjatscheslaw S. Morosow and Walerij A Makarow published in the russian magazine "Chimi-ja i Zisn" (chemistry and life, No. 3, March) the model of a dodecahedron of the earth. The known botanist, science journalist and writer Christopher Bird published, under the title "Planetary Grid" in May, 1975, in the american magazine "New Age Journal" a summary of the russian works about the crystal structures of the earth. This publication initiated an absolutely new phase in the development of the hypothesis of the crystal planet, and made the idea on one of the central subjects of the New Age. The surface of the earth is a closed surface, so without edges. If one lays on a planetary oscillation system such a surface, purely mathematically looked, however, only such oscillations can be based which are likewise closed in themselves, so building standing waves. It is unimportant whether one looks at oscillations electromagnetical or mechanical (and with thus also geological). The consequence of the fact is that a tetrahedron- or dodecahedronstructure of the planet cannot be the cause (because of the edge lines which own a limited length), but originates as a sum from several basic oscillations. However, this is called also, that at the level of the geometrical or stereometrical structures no solution is. Even the appearance of several oscillation figures is more probably, as well as will be seen. The consequence from this publication is, in any case, that pure tetrahedron-, octahedrons, dodecahedron and icosahedron models deliver only partial views of the complete oscillation field of the earth, and, hence, cannot be entire. It will be same that all Platonic solids are possible as oscillation figures. In 1995 Jeane Manning and Nick Begich published for the first time the subject HAARP in a book. The German version appeared in 1996 under the title " Holes in heaven - the confidential ecological war with the ionosphere stoker HAARP ". Since then the discussion does not break off in the general publicity around the controversial project. Especially in circles of so-called conspiracy theorists there circulate, in the meantime, hair-raising rumours, that Haarp explain as a global geophysical weapon or as a machine to consciousness manipulation . With the help of the oscillation model developed in this book, indicates a row of astonishing statements, about functional way and possibilities by Haarp. Besides, will appear what is behind Haarp far less than rumour mill spreads. Since the appearance of the books "The Bermudas triangle" in 1974/75 and "Without a trace" in 1977 from Charles Berlitz the Bermudas triangle has become a general concept around which, however, many rumours entwine themselves. The results of the magnetic field investigation of the author to the produced knowledge allows a statement to one of the phenomena of the Bermudas triangle. Namely about the cases described up to now of mysterious compass behaviour like gyrating or swaying the compass needle or also the static magnetic variation for which there is an amazing answer. On account of the present considerations occurs here now the presentation of a model whose starting point is the whole magnetic field of the earth, so the total intensity of the magnetic field (at a place on the earth). The field of the total intensity was chosen, especially because it is virtually steady timewise, about long margins, so a stationary field explaining and hence, is suited well for a general analysis of the earth magnetic field. This publication concludes the missing link between physics and parts of the radiesthesia as well as the geomancy, as far as it concerns the global net grids. This book answers many questions and explains numerous puzzling phenomena, while it builds a bridge between physics or geophysics and the biology. It concerns the geophysics radically, as far as it concerns the layer structure of this planet and it makes available a well-founded basis model (with regard to electromagnetic compatibility) to the geobiology. In addition, an overview about the research to the electromagnetic compatibility and to the magnetic adoption of the last hundred years is offered by which the book is also suited excellently as a reference book. It would be still pointed out to the fact that the version published here shows merely one shortened (and partially also unedited) version of the book. So much material is still included that the mathematically, physical basic scaffolding of the oscillation model is understandable. Chapters 1 and 3 serve the introduction and indicate, that the dipole field only is not enough to describe the magnetic earth field. Chapter 2 serves the introduction of the complete magnetic field respectively the total intensity. All farther considerations and evaluations are based on the complete magnetic field of the earth. In chapter 4 happens a first (angle) analysis for the magnetic extreme values of the earth field. Chapter 5,6,8,9,10,11,12 show the mathematically, physical basic scaffolding of the oscillation model. Chapters 13, 14 and 17 contain the analysis and the connections between the magnetic oscillation system and the bowl construction of the earth, as well as the layers of the atmosphere and, in the end, the figure of the earth. Chapters 7,15 and 16 contain the connections between the magnetic oscillation system to the earth frequency and the Schumann frequency as well as the Sferics. Chapter 18 gives an overview about the research to the magnetic sense and to the electromagnetic compatibility during the last hundred years. Chapter 19 is dedicated to the Haarp project and his relations with the earth magnetic field. Chapter 20 contains predictions, they arise from the magnetic oscillation model, as well as a result of the won knowledge. The theory, which is developed in this book is based on the remake and expansion of an old idea. It was the idea of a central body, preferably in the shape of a ball, formed around or in concentric layers. Democritus was the first who took this idea with his atomic theory and thereby introduced himself to the atoms as fixed and solid building blocks. Is the atom used as a wave model, that allows to interpret concentric layers as an expression of a spatial radial oscillator so you reach the current orbital model of atoms. Now, this book shows that these oscillatory order structures, described by Laplace’s equation, on earth and their layers are (geologi-cally and atmospherically) implemented. In addition the theory can be applied on concentric systems, which are not spherical but flat, like the solar system with its planets, the rings that have some planets and the moons of planets or also the neighbouring galaxies of the milky way. This principle is applicable on fruits and flowers, such as peach, orange, coconut, dahlia or narcissus. This allows the conclusion that the theory of a central body as a spatial radial oscillator can be applied also to other spherical phenomena such as spherical galactic nebulae, black holes, or even the universe itself. This in turn suggests that the idea of the central body constitutes a general principle of structuring in this universe as a spatial radial oscillator as well as macroscopic, microscopic and sub microscopic.